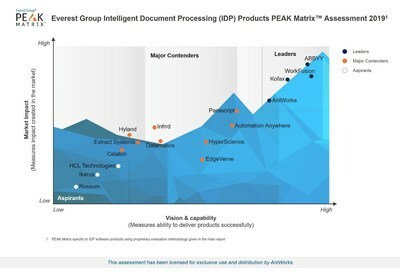 SINGAPORE, March 29, 2019 /PRNewswire/ -- AntWorks™, a global provider of artificial intelligence and intelligent automation solutions, announced today that it has been positioned as a 'Leader' in Everest Group's PEAK Matrix™ for Intelligent Document Processing (IDP) 2019. Everest Group evaluated 16 IDP technology vendors for Market Impact and Vision & Capability in this year's PEAK Matrix™ Assessment. Everest Group mentions Leaders command higher overall satisfaction amongst their clients than Major Contenders and Aspirants. Leaders' clients are highly satisfied with their product vision & roadmap, IDP product capabilities, and their ability to help them achieve better business outcomes. 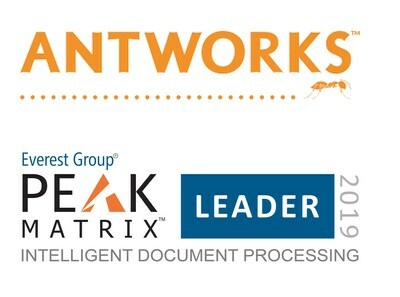 "AntWorks is a Leader in Everest Group's PEAK Matrix™ for IDP software products in 2019. It's ANTstein™ platform takes a distinctive approach leveraging fractal science rather than neural networks for cognitive / ML capabilities," commented Anil Vijayan, Practice Director at Everest Group. "Through distinct but integrated multi-format data ingestion, RPA, and IDP capabilities, it also offers the flexibility for enterprises to consume either in a full-stack or in a modular fashion. Driven by its platform's ease of use, flexibility, and adaptability to changing business requirements, AntWorks has positioned itself for further success." "Our recognition as a Leader in IDP is a testament of our vision, strategy and market success with enterprise Integrated Automation Platform (IAP), ANTstein™ with our proprietary industry leading computer vision product - Cognitive Machine Reading (CMR). CMR provides superior results on data with small variances like business processes enabling higher straight through processing results," said Asheesh Mehra, Co-Founder & Group CEO, AntWorks. The report says that AntWorks' ability to process unstructured data such as images, handwritten fields and signatures (verification) within documents and contextualise the extracted fields through natural language processing (NLP) has helped their enterprise clients automate document processing use cases such as title insurance, trade finance, and financial statements. The report also says that reference clients were highly satisfied with the flexibility of AntWorks to adapt to their changing business requirements and proactiveness in sharing their evolving product vision and roadmap on a regular basis. AntWorks is a global artificial intelligence (AI) and intelligent automation company that creates new possibilities with data through digitisation, automation, and enterprise intelligence. As the world's only platform that understands every data type, AntWorks' Integrated Automation Platform, ANTstein, digitises every bit of information for a diverse range of industries. By creating human-like bots in a low-code/ no-code environment, ANTstein innovates new ways to automate complex processes. AntWorks' solutions power up enterprises with accurate insights through an integrated, intelligent, technology stack that automates and learns independently. Put simply, it accelerates the new, constantly. ANTstein is also the first and singular Enterprise Intelligent Automation Platform powered by fractal science principles and pattern recognition.